VR and AR applications are among the hot topics in the tech world. Though amazing, most products and applications in this new industry are quite pricey. This week’s #WebsiteWednesday therefore brings you an affordable alternative that works directly with your iPhone – Elsewhere.xyz. 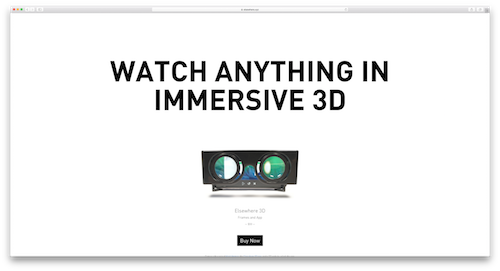 Elsewhere.xyz, created by former Mozilla exec Aza Raskin, are 3D glasses which can be used in conjunction with an iPhone to generate 3D video. By using Elsewhere’s patented algorithm, the app that is included with every purchase can extrapolate depth data from traditional media on the fly. The end result is a stunning 3D image, which makes details of your photo collections pop out in crystal clarity and shows an added dimension to your favorite videos. The best part is that Elsewhere can be used on virtually any content. Streaming sites, video previously recorded on your phone, and even live-video being shot through your iPhone’s camera are all able to be viewed in real time through the Elsewhere app, which can be downloaded on Elsewhere.xyz’s website or in the App Store. To launch their new product, Elsewhere was able to secure an excellent one word URL with Elsewhere.xyz. The clever combination of the adverb ‘elsewhere’, paired with the axes of the 3 dimensions x, y, and z to the right of the dot, is another brilliant brand built on an .xyz domain. With a memorable domain name and their affordable price-point built on robust technology, Elsewhere.xyz is sure to keep turning heads.